When it comes to the Montreal Canadiens’ goaltending hierarchy, there is no doubt that Carey Price is on top. As the top goaltender in the league and the face of the Montreal Canadiens, he casts a shadow on some of the league’s other goaltenders including the ones in the Habs’ system. Price is Montreal’s present and future but there are other goalies who could be joining him in the NHL later on. The organization has several other intriguing options in goal from the NHL to the NCAA. Dustin Tokarski has won at all levels of hockey including midget, the WHL, the AHL and with Team Canada. 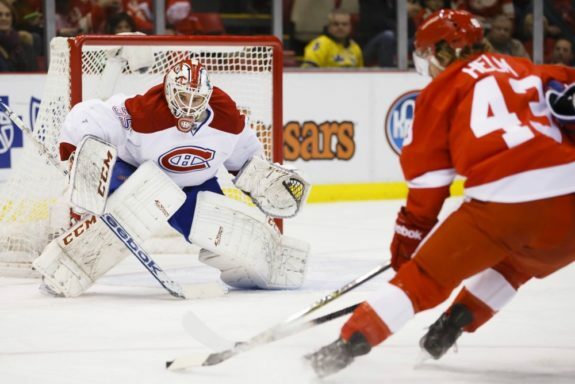 He stepped into the spotlight in the 2014 NHL playoffs during the Eastern conference final when Price was injured and head coach Michel Therrien chose the rookie Tokarski over veteran backup Peter Budaj. Tokarski’s performance helped him cement his role as the backup this season as GM Marc Bergevin shipped out Budaj to make room for Tokarski. Tokarski’s first year as Montreal’s backup goalie was full of ups and downs. He appeared in only 17 games as Price continued to have the lion’s share of the starts in Montreal during his historic season. At times, Tokarski was excellent but he also struggled mightily in net at points during the season. It was unlikely that he would maintain the level of play he displayed in the 2014 playoffs, but his struggles came with questions. Were his struggles due to rookie growing pains that most NHL goalies experience? Did having a lessened workload make Tokarski lose his rhythm? Or could it be that Tokarski was the victim of playing behind a Habs team that struggled to score and maintain possession, reaffirming the fact Price was the reason the Habs won last season? Either way, if Tokarski doesn’t step up his game next season, he could easily be replaced by someone below him in the organization or the team could easily go out and find a backup through trade or on the open market. Mike Condon was a free agent signing out of college in 2013 who has managed to steal the number one job for Montreal’s AHL team (the Hamilton Bulldogs have since become the St. John’s IceCaps). The farm team for Montreal has struggled in all facets the past few years but Condon has been one of the positives. His numbers last year were excellent and the number one job with the IceCaps is Condon’s to lose. Condon signed a two-year contract extension with Montreal back in February and the most interesting part of it is that the second year becomes one-way which indicates that the Habs see Condon making the jump to the NHL as the backup. It puts extra heat on Tokarski to perform better with Condon hot on his heels. Condon’s rise has been interesting to watch as he has gone from afterthought to potential threat. Zachary Fucale – Future Heir? Zachary Fucale is the Habs’ top goaltending prospect and he is making his professional debut his fall after a four year career in the QMJHL that was filled with championships and individual accolades. However, there are concerns that have arisen regarding Fucale’s game since being drafted. Letting in soft goals has been an issue as well as rebound control. Luckily, his issues are fixable but the fact is he looked far from dominant at times in his last junior year. Fucale has the biggest upside amongst this group of goalies but he needs time to develop further. His potential has him as an NHL starter and with Price locked in for several more years, the organization has time when it comes to Fucale. With Condon more or less the designated starter in St. John’s, Fucale will battle former Winnipeg Jets prospect Edward Pasquale (who missed the 2014-15 season recovering from hip surgery) for the backup role. Hayden Hawkey was picked by Montreal at 177th overall in the 2014 NHL draft where he was coming off an excellent season that culminated in him winning the USHL’s Goaltender of the Year award. Unfortunately, Hawkey’s 2014-15 season got off to a rough start before he blew out his knee and missed the rest of the season after surgery. He will be attending Providence College in the fall and with Calgary Flames prospect Jon Gillies off to the pros, Hawkey has a huge opportunity to seize the number one role for the Friars. He is a long term project for Montreal as he will likely play four years of NCAA hockey before moving on to the pros. The Habs have a lot of intriguing goaltending options after Carey Price especially in the AHL. Goaltending hasn’t been a big focus at the draft for Montreal though it wouldn’t be a bad idea to add another junior aged goaltender to the system as a long term investment. The next year or two will see some movement in the Habs’ goaltending hierarchy as there could be a new backup behind Price and a new number one in St. John’s.